​For the past 8 years, the walk-a-thon (or, “Walkapalooza”) has been our student-based fundraiser. It has thrived, but this year we thought we’d break from tradition and create a new opportunity embodying interests for a broader base. As our student body grows, the interaction between students across all grade levels becomes more challenging. We have been looking for ways to strengthen the student community and provide opportunities for students from different divisions to develop relationships, practice social skills, and practice teamwork. By having a variety of events on campus during school hours, it becomes a fully inclusive event for all students. Another goal is to encourage physical exercise. Understanding that our student body has differing attitudes toward “traditional sports” or even physical activities in general, we are adopting a 2e approach to what some of us may have experienced in a typical school Field Day. The Decathlon is comprised of 10 non-traditional events, playing to different strengths and encouraging teamwork. The events are designed with Bridges kids in mind. Most events are a twist on traditional games, designed to put all students on more equal footing, while also being fun. Students are encouraged to participate in as many events as they would like and push out of their comfort zone in a safe space. The more participation from teammates, the better chance a team will have to win the Grand Prize! There will be 15 teams, each comprised of Phoenix, middle, and high school students, with three faculty members (one from each division) shepherding the teams from station to station. High schoolers will serve as team captains responsible for encouraging, managing, and motivating their teams to victory! The division directors have worked together to thoughtfully form the teams which will be announced during an all-school assembly on Thursday 1/31. Teams will meet weekly leading up to the event to create team names, practice events, and get to know each other. The day of the Decathlon will start off as any other day, then students will lunch with their teams — and let the games begin! All events are on campus, mostly outdoors. Water will be available for free. Gatorade and snacks will be available to purchase during the event. Teams will earn points as they rotate through the events, and the teams with the most overall points will win gold, silver, and bronze medals. We will recognize everyone’s achievements during a closing ceremony at the end of the day. There are many opportunities to win! Grand Prize — choice of team celebration: go-karts, escape room, off-campus lunch, etc. Top Fundraising Team: The team who raises the most money will receive a Grand Prize — a choice of team celebration: go-karts, escape room, off-campus lunch, etc. Students can customize their own website with photos and videos using our online fundraising tool, making it easy and fun to reach out to friends and family across the globe. Donations are given online, and students can track the progress vs the other teams and individuals. Fundraising is an important element of the Decathlon and we hope students will join the effort. Students can earn prizes for raising money. 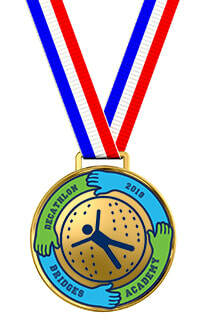 However, THERE IS NO COST TO PARTICIPATE IN THE DECATHLON. GIFT CARD PRIZES FOR STUDENTS: $250 raised = $25 gift card; $500 raised = $50 gift card; $1,000 raised = $100 gift card. Students may choose Amazon, Apple iTunes, Steam, or Game Stop. PARENTS – JOIN THE FUN! We have plenty of volunteer opportunities available. Take the afternoon off and enjoy supporting the whole student body for this unique and fun day. Sign-up information to come soon!